Our illustration at right, “Gene Regulated Transcription,” appeared in last year’s Medical Illustration SourceBook. 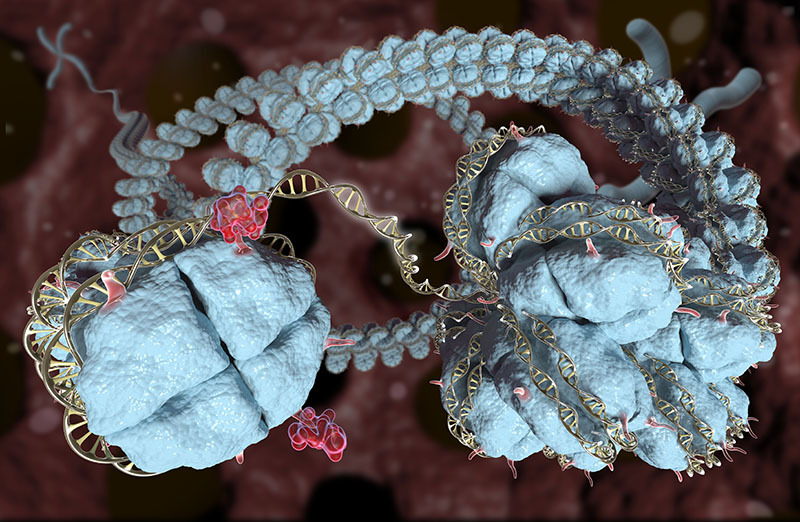 Briefly, the illustration shows an unwound segment of DNA made available for use as a blueprint to create, e.g., cell membranes, enzymes, hormones, etc. I loved the illustration but wasn’t keen on submitting it to the SourceBook– the science behind the illustration is complicated, complex, and far-removed from our everyday experiences. Now there is a book by Pulitzer Prize winning science reporter / author, Amy Ellis Nutt, that connects the world of genes and DNA to people in the world around us. Becoming Nicole is the true story of two identical twin boys who had obvious differences in gender identification from an early age. Identical twins with identical DNA, but variation in genetic blueprint reading resulted in twins that are no longer identical. 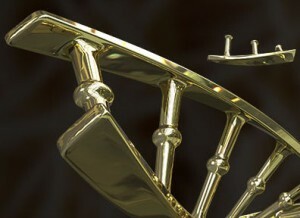 Curved DNA strand with base pairs between “rails” in the foreground. In our business, we often work with scientists, researchers, and technical experts. As a non-scientist, I am in continually in awe of the discoveries and efforts to make the world a better place to live, e.g., last week’s announcement by the Nobel Prize in Chemistry for work in mapping cell repair of damaged DNA on a molecular level. Greetings from the Plains of Nebraska! For years, I’ve made calls, sent emails and mailings to let others know about our company, AlbrechtGFX. Now I’m also blogging. That’s what happens in a company with just a few employees–sometimes you have amazing opportunities you’ve never sought or expected to do. Greetings from the plains of Nebraska, in the middle of the United States! Not exactly the epi-center of high-tech, but not a backroads place either. We’re here because we’re native Nebraskans who happen to have a great interest in transforming complex biological content in to visuals that make science understandable, relevant, and compelling. 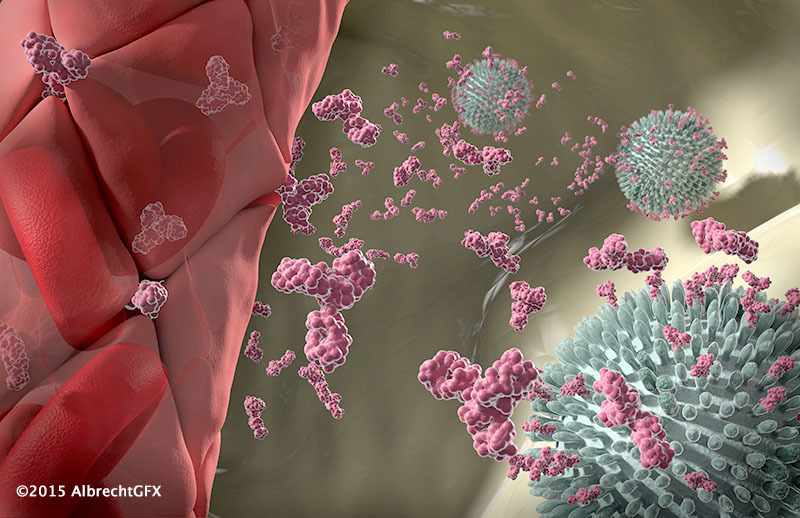 Here’s our sample 3D illustration from the 2015 Medical Illustration SourceBook, “Antibodies Neutralizing Respiratory Viruses.” The left side of the illustration shows antibodies released from a capillary attacking respiratory viruses on the right. 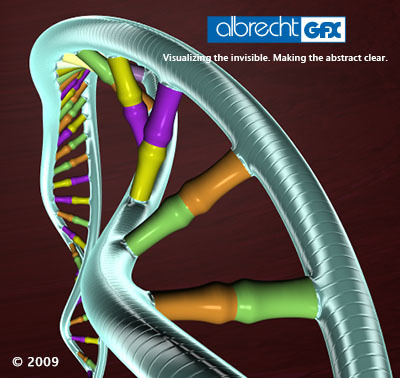 AlbrechtGFX visuals tell the stories of scientific innovation for biotech companies and the advertising agencies that assist them. We translate scientific, technical content into visuals that make information understood and messages memorable. That is especially valuable when the concepts involved are difficult to explain and / or impossible to view. It’s said that: “A picture is worth a thousand words.” To that, we add: “In any language. No translation required.” AlbrechtGFX 3D illustrations and animations transcend language barriers and communicate ideas internationally. AlbrechtGFX creates visuals that match the level of detail / complexity that best fits your audience, e.g., technical vs. non-technical. All AlbrechtGFX visuals are designed to reflect our clients’ company image, commitment to quality, investment in R & D, and product branding. AlbrechtGFX clients work directly with an experienced 3D scientific illustrator/animator who can translate technical content into 3D illustrations and animations useful for sales, marketing, public relations and training purposes.